The Schil, a mountain in all but name, overlooks the head of the College Valley and enjoys an outstanding panorama of West Hill and the mightily impressive ice-sculpted cleft of the Hen Hole. It stands on the route of the Pennine Way and has one foot in both England and Scotland. It is the last major summit for those hardy `wayfarers` who are heading towards the end of their epic journey at Kirk Yetholm and, for those heading in the opposite direction towards a very distant Edale in Derbyshire, it is a taste of many more things to come. On this walk you will experience the peacefulness of one of the finest valleys in the area before starting your long and steady ascent to higher ground. 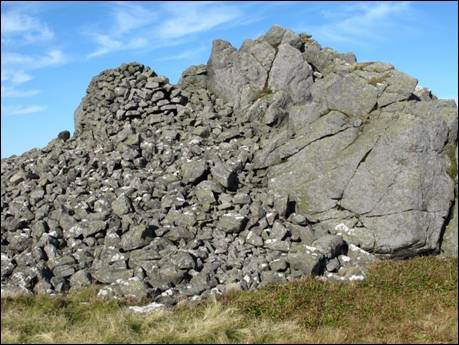 Once there you will make your way to The Schil where you will have the opportunity to explore the many small crags that are dotted around the grass-covered summit. After soaking up the extensive views you will follow the thin border fence first to Black Hag and then, caught between the valleys of the Halter and Trowup Burns, along the crest of the magnificent Steer Rig. A brief but sharp ascent will then deliver you to the top of White Law and its excellent west spur. A quiet downhill track will then deliver you back to the tiny trickle of the Halter Burn and a mere hop, step and jump away from the point where you began your classic border circuit. 1. In his 1968 book, `Pennine Way Companion` Alfred Wainwright suggested that, “Kirk Yetholm would seem a lovely village to anyone who had walked 270 miles to reach it even if it were slums and slagheaps” and indeed they would. However, he went on to add that, “it is a lovely village, its setting in a pleasant valley is enhanced by trim cottages around a green, an attractive inn, an old pinnacled church and a quiet but friendly atmosphere”. Little has changed since `AW` put pen to paper as you will undoubtedly see for yourself when you reach the Border Hotel and turn uphill on a single track road towards the starting point of your walk in the beautiful Halterburn Valley. Once you have crested the last rise in the road a steep descent will take you quickly to the valley bottom where, after crossing over a cattle grid, you must turn left onto a rough track. Here there is ample parking space on the adjacent grassed area (GR NT839276). It is a tranquil spot close to the thin thread of the Halter Burn and the steep slopes of Green Humbleton to the east and the undulating summit of Staerough Hill to the west. This small but very fine hill was described by Robert Hugill in his 1931 book, “Road Guide to Northumberland and the Border” as, “the conical, craggy height behind Kirk Yetholm” and a hill, “worth climbing for its view of the Cheviots and the Bowmont Valley”. It most certainly is but, alas, it will have to wait for another day as your route now follows the quiet valley road southwards. This is an easy start to your day with barely a ripple in the single track road to trouble your itching-to-be-climbing legs or your barely-expanded lungs. So, take the opportunity to enjoy the early morning stroll first past the cluster of buildings currently named `Peniel` and `Pennine Cottage` and then, as the tarmac ends and a rough track begins, the farm buildings of Halterburnhead. The keen-eyed amongst you will notice that the 2009 revision of the Ordnance Survey 1:25,000 scale map of the area refers to this farm by the name of Burnhead whilst the name plate at the entrance to the farm states otherwise. 2. Continue past the large shed on your left and on reaching a signpost turn left as indicated, `Pennine Way`. Once across the nearby stile turn sharp right and follow the boundary wall-hugging (and slightly awkward) path with the buildings of Halterburnhead away to your right. Soon, after a little slipping and sliding, you will see ahead of you a small wooden footbridge which crosses the Halter Burn and once you are on the opposite side head diagonally left up the facing slope to join a rough track heading left. You will continue to follow the low level alternative Pennine Way route until you reach higher ground near Corbie Craig. Route finding is an absolute doddle and requires nothing in the navigation skills department. As you continue forwards the slopes of White Law, indented by the impressive North and South Deans, rise steeply to your left. The track then turns sharp right and in front of you will be the lonely ruins of Old Halterburnhead, a cottage which had its roof blown off more than 80 years ago since which time it has been in a state of steady decay. It is strangely picturesque especially when viewed from the opposite end. The rough path now contours the lower slopes of Latchly Hill with the long line of Steer Rig, your return route, over to your left. 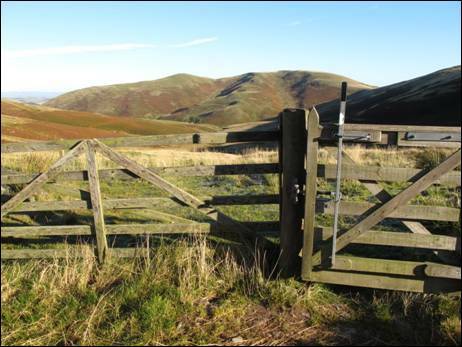 Once through the gate at Pipers Faulds (GR NT851243) take a deep intake of breath as your climb, initially across the side of Steerrig Knowe, is about to begin. In all probability, if you have made an early start, the next part of your route will be in deep and often cold shadow. 3.The track heads steadily uphill, first through a couple of hairpin bends and then in a relatively straight line as it labours from a height of 330 metres (1083 feet) at Piper`s Faulds to 484 metres (1588 feet) above sea level at the gate onto open ground. The views as you climb ever-upwards of the Curr Burn and Latchly Hill, to your right, and the huge bulk of The Curr, more or less straight ahead, are particularly outstanding. Eventually, you will reach the gate and, if the weather gods are with you, sunlight will flood across the vast Cheviot landscape in front of you. You have now reached the saddle between The Curr, on your right, and Black Hag, to your left as well as the watershed of the south-travelling Rowhope Burn, not to be confused with the burn of the same name in Upper Coquetdale. Once you have caught your breath and topped up your liquids continue along the clear track passing beneath the rocky outcrop of Corbie Craig. If energy levels permit, and how can you resist, a straight-line ascent to this stone promontory will be well rewarded. You have now joined the main route of the Pennine Way which you will follow all of the way to the summit of The Schil which is now clearly within your sights. Soon you will reach a ladder stile which will lift you from Scotland and deliver you neatly onto English soil. For the remainder of your climb to the summit you will follow the border fence on your right first across relatively flat, although potentially damp, ground and then, as the gradient begins to rise, through a series of small rocky outcrops the largest of which (GR NT869225) is well worth a slight side detour. Eventually, you will see, on the opposite side of the post and wire fence, the frost-shattered slabs of light grey rock which mark the outstanding 601 metre (1972 feet) top of The Schil. This impressive-looking, upward-thrusting rock is one of only a handful of exposures of the metamorphic aureole which surrounds the highest hill in the range, the mighty Cheviot. So, time to hop over the fence and to make your way to the true summit which can be reached by a short, easy scramble. Once you have taken in the superb view from this lofty perch be sure to explore the western side of the summit dome and, looking back to the rocky top, described by James Logan Mack in his 1924 book, `The Border Line` as, “a huge, confused, irregular mass of stones”, you will see for yourself what Logan Mack thought was, “evidence of human handiwork in its construction”. By whom and for what purpose such a large quantity of stones was piled together remains something of a mystery. 4. There are so many different views to be had by wandering around the summit area so you would be well advised to allow yourself plenty of time to do this fantastic hill justice. If you are lucky in your wanderings you might just discover the small brass plaque which is screwed into the rough face of a slab of rock and reads, “In memory of Steve Bertram who died on the 20 November 1999 doing a sport he loved”. Once you have satisfied yourself that there is nothing more to see, retrace your steps to the ladder stile across the border and step over to the other side. Continue to follow the `Pennine Way` beneath the imposing Corbie Craig as far as a three-fingered signpost. Follow the finger which indicates, `Pennine Way High level main route Kirk Yetholm 4½` and continue around the flanks of Black Hag. 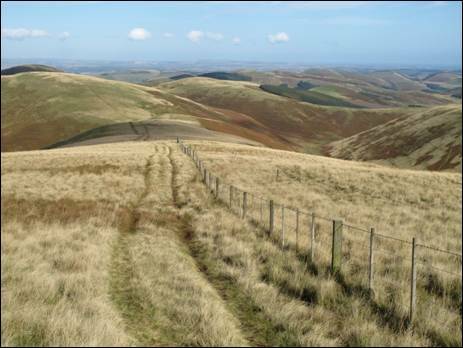 Go through the next small gate which marks the start of one of the finest grass-covered ridge walks in the Cheviot Hills. As you head over Steer Rig the trajectory is generally downhill, a loss of height of some 90 metres until your next and last substantial climb of the day, and the views to the valleys of the Halter Burn, to your left, and the Trowup Burn, to your right, are mouth-watering. 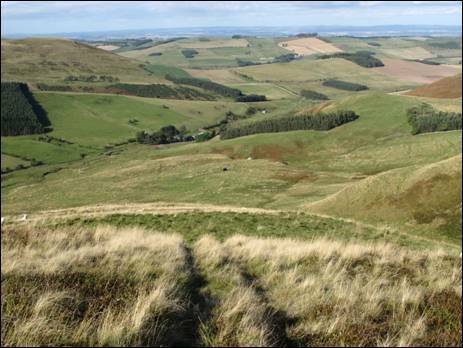 Ahead lies White Law, a short, sharp sting in the tail but first, enjoy the views. On a clear, crisp day you can even spot the thin blue, horizon-grabbing line of the distant North Sea behind a multitude of green, rolling hills. Standing on Scottish soil, Northumberland will seduce you! Before you tackle the lung-expanding climb of White Law, have a glance over your left shoulder and you will see, below you, the lonely ruins of Old Halterburnhead which you passed all those hours ago. 5. Now gather yourself for the sharp uphill haul to the top of White Law (GR NT857261) a hill which Tony Hopkins in his 1989 book, `National Trail Guide Pennine Way North` thought was, “of modest height”, although he added, the slopes are steep,” and, “the summit has a fine outlook, north-west over the Tweed Valley to the Lammermuir Hills and north-east to the Bowmont and the Till”. Standing at a height of some 430 metres (1411 feet) the views from this well-located hill are indeed outstanding and you may well linger longer than intended. However, all is not lost as another fine selection of views awaits your arrival at the west spur of White Law little more than a 550 metre stroll away. Now tear yourself away from your extensive panorama and continue to follow the border fence as it angles to the right before descending to Whitelaw Nick (GR NT853262) and the point where you will part company with the Pennine Way. So, ignoring the ladder stile and the signpost, continue with the fence and the drystone wall up the grass-carpeted slope to reach the unmarked 410 metre (1345 feet) top. An oval hillfort once occupied this spur and whilst most of the fort has long since disappeared part of the double ramparts can be detected on the ground as faint crests, unbroken except at the entrances. A few boulders at various points in these crests suggest that the ramparts may have been faced with drystone walling. 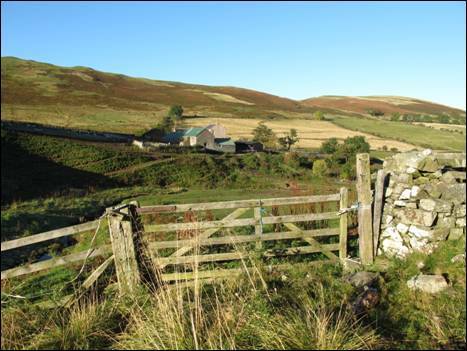 Keep with the fence and the wall as they slip across the relatively short top and then begin their hand in hand descent towards the Halterburn Valley and the out-of-sight farm of Halterburnhead. Eventually, when the fence and wall decide to turn left you will need to pass through the small gate immediately on your right and once on the other side walk straight ahead. At this point there is little in the way of a path or track but soon, as the slope falls away, you will meet up with the dual imprints of a quad bike at which juncture you should turn right and stay with the track as it winds its way downhill. By now, unless you are engulfed in some very low cloud, you will be able to see the narrow valley road together with the buildings of `Peniel` and `Pennine Cottage`. The rolling hillsides immediately in front of you are decorated with a number of small linear plantations whilst those beyond are a patchwork of cultivated fields. The prospect is very pleasant indeed and makes for a delightful descent. Make sure, as you head downwards, to keep your sights firmly fixed on an old railway waggon situated further downhill as the track you are following can be faint in places and, in all probability, you will lose sight of it from time to time. Remember that the deep indentation of Dryslack Burn will always be to your right. Once you have reached the valley road, close to the lovely Witchcleuch Burn (GR NT841268), turn right and within some 10 minutes you will be back where you started the day, a little older and perhaps a little wiser. Maybe you will feel that you have earned a homeward bound `pit stop` at the Pennine Way-ending Border Hotel. Mainly good paths/tracks over grass-covered terrain. A number of ascents & descents. Two stretches of tarmac. Small hotels, guest houses & cottages in Kirk Yetholm area. A caravan park/camp site in Town Yetholm.